Ireland is to make a clean exit from the IMF/EU bailout when we leave the program on December 15. There will be no precautionary credit line negotiated with the European Central Bank or the IMF, no backstop, no insurance policy in case we get into financial trouble again in the months and years ahead. We're going it alone. It's a brave move and we can only hope that it's the right one. The decision not to seek a credit line came in a dramatic announcement by Taoiseach (Prime Minister) Enda Kenny in the Dail last week. There is no doubt that the decision was based on political concerns more than on economic policy. There were strong economic reasons why a credit line -- even if we never use it -- might have been a good idea. Our ability to fund ourselves going forward after we exit the bailout program depends on growth in the Irish economy in the next few years and the absence of any nasty surprises, especially from the banks. Neither of these things is certain. Because we are an export-led economy, growth here is dependent on a sustained recovery in Europe and beyond, and that is far from guaranteed. We need a strong recovery in the global economy to increase demand for our exports. If the European economy and the world economy limp along with little or no growth then we will be in trouble. The banks are also a real concern. Our banks are still basket cases, and there is a European wide stress test for banks coming next year which could expose just how weak they are. And because it's an EU stress test we won't be able to fudge the outcome. There is a huge unresolved problem in our banks due to the number of domestic mortgages in crisis, and the number of people deep in negative equity after the property crash. The potential losses involved have never been crystallized on the books of the banks. They have billions in property loans on their books which have not been written down to their current value. So we have two major problems. If the European economy fails to grow then our exports won't increase and the growth we need in the Irish economy to enable us to fully fund ourselves again, including making our debt repayments, won't happen. If the banks are forced to admit the real level of losses they face on domestic mortgages and write down the loans accordingly, then they are likely to need another big capital injection to meet EU solvency standards. At present they are ignoring the reality, hoping that if they delay long enough the property market will recover sufficiently to solve the problem for them. So we face an extremely uncertain future in the next couple of years. Things could pan out the way we want. But they might not. Even the government admitted last week that it had been "a finely balanced decision" not to seek a credit line. I remember hearing Minister for Finance Michael Noonan just a couple of months back saying that it might be prudent to seek a backstop of around €10 billion. So why did he change his mind? Several reasons have been put forward. We have built up a cash pile of around €20 billion in borrowings in the treasury piggybank here, enough borrowing to get us through 2014 and part of 2015. So when we go back to the markets in the next few months we could cope even if they decided they wanted us to pay penal rates and we decided not to borrow. We can get through any short term difficulty. Perhaps more important, the general economic picture in Europe at the moment is relatively benign in comparison with the chaos we saw over the past few years when several countries were on the verge of financial collapse. So it's a good time to be leaving the bailout and going back into the markets to borrow under our own steam. In addition, we have shown an ability to cut spending and increase taxes to reduce the budget deficit, although we still have a way to go to get down to the three percent of GDP deficit that is our target and is the agreed maximum among the EU countries. The reality is that we will have to go on borrowing for another few years as we balance the national books again. The more we can grow the economy the more tax revenue will increase and the less tax hikes we will have to impose , which is why growth is so important. But in the meantime we have to continue borrowing to keep state services going at an acceptable level. The signs are good, with our state bonds now back at reasonable rates, which indicates that the markets have confidence in us. The government has been testing the water over the past year with small amounts of bonds being offered and taken up. There is unlikely to be a problem when we go back into the markets in the coming months to borrow on a serious level. All of these are reasons why the government decided that we didn't need a backstop. They wanted to send out a clear message to the markets that we are back, and we are standing on our own two feet. They also wanted to avoid the strings that would have come with a credit line which would have meant ongoing conditions and extra oversight from the EU. In particular, a few other countries were making noises about the tax regime we use to bring so many foreign companies in here, companies that might otherwise go elsewhere in Europe. Rather than let anyone open that can of worms -- and to avoid a lot of other financial interference from Europe -- the government decided to avoid asking for backstop. One can appreciate their reasoning. But that does not diminish the potential for it all to go wrong. And if it does, we will have to go back to the EU and the IMF again for another bailout injection. It won't be on a Greek scale, but it won't look good. So this "clean exit" from the bailout is a risk. It's a risk we did not have to take. And you might ask why the government choose to do so. As we said above, the real reason is political, not economic. Asking for a credit line and accepting the conditions that would have been part of that would have taken the shine off the government's moment of glory, the big success in getting us to the point where we are ready to exit the bailout on time. Instead of being able to declare that we are fully taking back our economic sovereignty on December 15, the government would have had to talk about the continuing external oversight of our economy that would have come with a backstop. Given what the Irish people have been through with the austerity program, it is vital for the government to be able to say, without equivocation, that it was all worth it because we are the masters of our own economic destiny again. If they can get that clear message across, they have a chance of winning the next election, despite all the cutbacks and unemployment. So you are going to hear a lot of triumphant speeches in the next few weeks as we exit the bailout. But it is important that everyone realizes exactly what the exit means. It does not mean that we are home free, that the economy is about to bounce back, or that we are now able to run the country without the massive borrowing that is still going on. It does mean that we are at the end of the program during which the IMF and the EU gave us billions so that we could keep the country going while we tackled the deficit. The program gave us a few years of breathing space to get our finances under control and get the deficit down enough so that the markets would start to lend to us again. (You will remember that it was the refusal of the markets to lend us any more funds that started the crisis.) We are now at that point. But it doesn't mean everything in the garden is rosy. 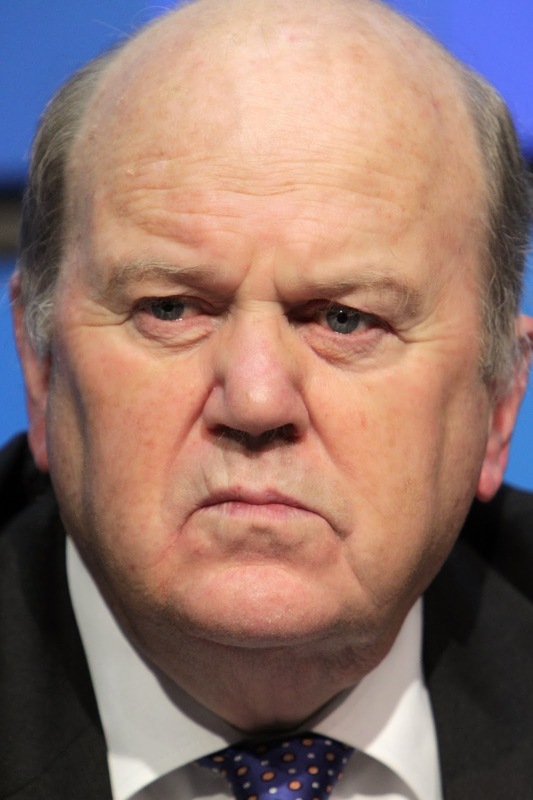 All the bailout money has to be paid back -- more than €65 billion euro of it. It's costing us billions in interest payments every year. That dead weight is going to be a heavy drag on any recovery here for at least the next 10 years. And remember that, apart from funding our budget deficits, a big chunk of the bailout money went to recapitalize the banks so that they could pay back all the foreign bondholders, even the unguaranteed bondholders. The decision to repay all the bondholders and dump the cost on the ordinary Irish taxpayer was forced on us by the European Central Bank, with the support of the Americans, because none of them wanted to see any bank failures here that could spread elsewhere. It was a terrible mistake, the scale of which is almost unimaginable. We may be making a "clean exit" from the bailout. But we will be paying for that mistake for years.